Please follow the link below for your version of Windows. 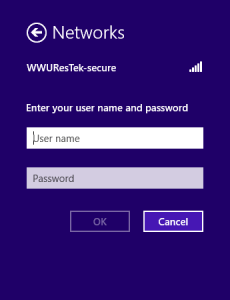 Forget the Network: If you have previously connected to the WWUResTek-secure network and have recently changed your Universal ID password, try forgetting the network to reset your network’s saved password. 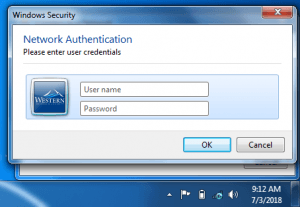 Windows Vista & XP users: In April 2017 Microsoft dropped security updates for Windows Vista and in April 2014 they dropped security updates for Windows XP. This means your computer could be susceptible to threats, such as viruses and malware. 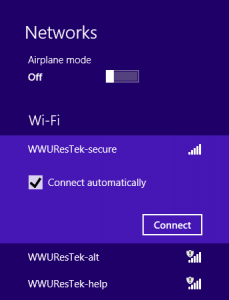 ResTek requests that you upgrade to Windows 10 BEFORE you connect to our network. 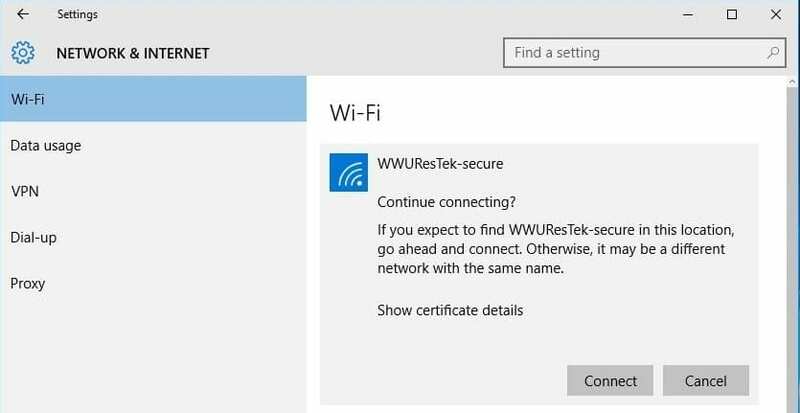 Connect to the WWUResTek-secure network using the following steps, if you are unable to follow the below steps please contact us via the methods to the right. 1. 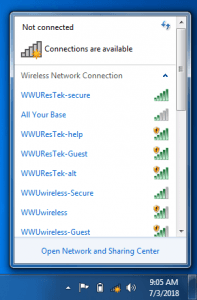 From the Windows 7 desktop, click on the wireless icon in the system tray (in the bottom right hand corner of the screen). Your computer will verify your credentials and connect. This may take a moment. 6. If successful, you should now see that you are connected. 1. 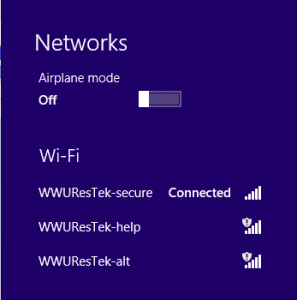 From the Windows 8 desktop, click on the wireless icon in the system tray (in the bottom right hand corner of the screen). 2. A blue bar will appear on the right. 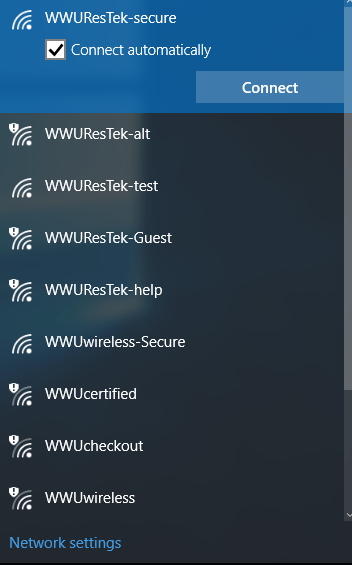 Click on WWUResTek-secure. 4. Enter your WWU Universal ID and password, then click OK.
5. You will be warned to view the security certificate. Optionally, feel free to view it. Then, click Connect. 2. A bar will appear on the right. 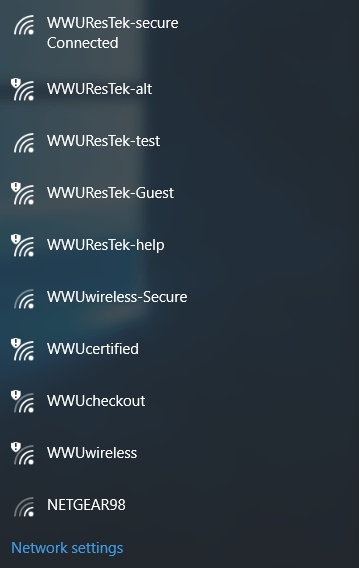 Click on WWUResTek-secure. 4. The Settings page will open and ask for your credentials. Enter your WWU Universal ID and password, then click OK.
5. 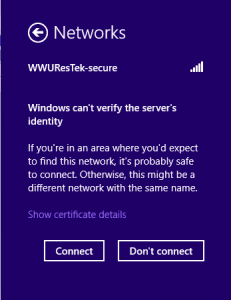 You will be asked to verify the connection. Click Connect. 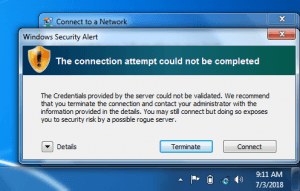 Follow these instructions to make sure that your computer is set to automatically obtain an IP address from the network. If you are using these instructions to troubleshoot your connection, you should open your web browser and attempt to visit a website once you have saved the changes. 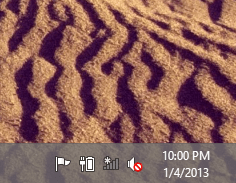 Windows 8/10: Go to Start > Control Panel > Network and Internet > Network and Sharing Center. 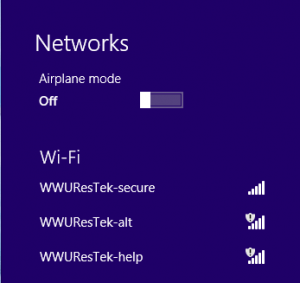 Click on Change Adapter Settings > Check that your Local Area Connection is enabled. 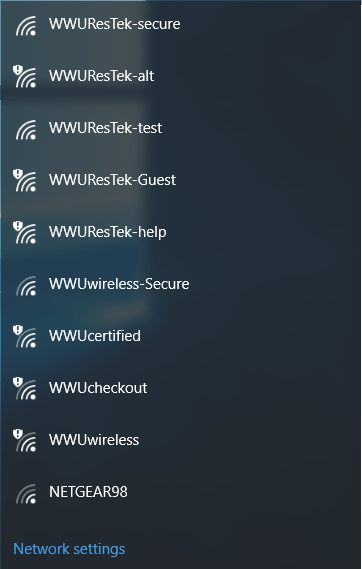 If not, right click on your connection and enable it. 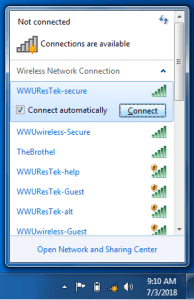 Press OK to save settings and exit TCP/IP Properties window. 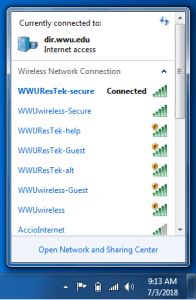 Click OK to close Local Area Connection Properties window. Open a web browser to check your connection.